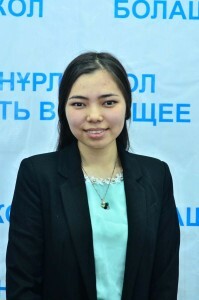 Imangalieva Aiym – the chairman of the Committee on Youth Affairs of the Department of Pedagogy, since the 2014 – 2015 academic year has been participating in the charity project “Kazakhstan-Astana” together with the international charity Fund “JWG” International ministry” (USA, FL) and PF “Best for kids” to provide charitable and scientific-psychological help to the children-orphans from the orphanages of Akmola region (Stepnogorsk and Akkol children’s orphanages). Certificate of excellence of the Academy of Leadership “Astana”, Astana, 2015. She was awarded the Grateful Letters of the President of the MMA Federation of Kazakhstan and the Asian Division of the world MMA Association for the help in the organization of the international professional tournament “M-1 Challenge – 59” “BATTLE OF NOMADS-5” WMMAA PRO ASIA DIVISION. The President of PF “Best for kids” and the President of the international Fund “Journey with grace international ministry”.